There are plenty of hare-brained plans to destroy net neutrality rules, but the latest is, like, hair-brained minus the brain part. You won’t be surprised to hear that the man behind it is attention addict and presidential hopeful Rand Paul. We need to have a chat about facts, Rand. Long story short: Rand Paul wants to ruin the internet by repealing the new—and widely loved—net neutrality rules from the Federal Communications Commission (FCC). “Ruin the internet” is a strong phrase, but it’s exactly what many very smart internet experts say will happen if strong net neutrality rules aren’t implemented. Senator Paul has now introduced a bill to the Senate that he intends to push through Congress with the help of a nebulous law that removes procedural hurdles when trying to repeal new regulations. Senator Paul has no cosponsors on the bill. This regulation by the FCC is a textbook example of Washington’s desire to regulate anything and everything, and will do nothing more than wrap the Internet in red tape. Well that’s wrong. There’s actually very little red tape involved in the FCC’s net neutrality rules. The rules are basically written to preserve the internet as it currently exists which, it should be made clear, is pretty unregulated. (More on this in a second.) You might call the provisions to prohibit internet fast lanes, traffic throttling, and website blocking “red tape.” But you might also call laws that prohibit injustice, theft, and censorship “red tape” as well. The Internet has successfully flourished without the heavy hand of government interference. Nope! The internet has long been regulated by existing communications laws, however minimally. The FCC classified broadband as an information service back in 2002, after the dot com bubble burst, and imposed a specific set of regulations that’s governed the internet for the past decade and a half. However, those regulations allowed internet service providers to do things that were good for their profits but bad for American consumers. That’s why the FCC crafted new rules that treat the internet more like a public utility—for the good of American consumers. Presidential hopefuls should probably be on board with that. Stated simply, I do not want to see the government regulating the Internet. Oh here we go. This might actually be a true thing that Rand Paul believes, but it’s utterly misguided. If Rand Paul didn’t want the government regulating the internet, he should’ve spoken up back in 2002, when he was just an eye doctor in Kentucky. Or even further back, like in 1985, when the first .com domain was registered. Or maybe back to the 1960s, when the dang government helped invent the internet. 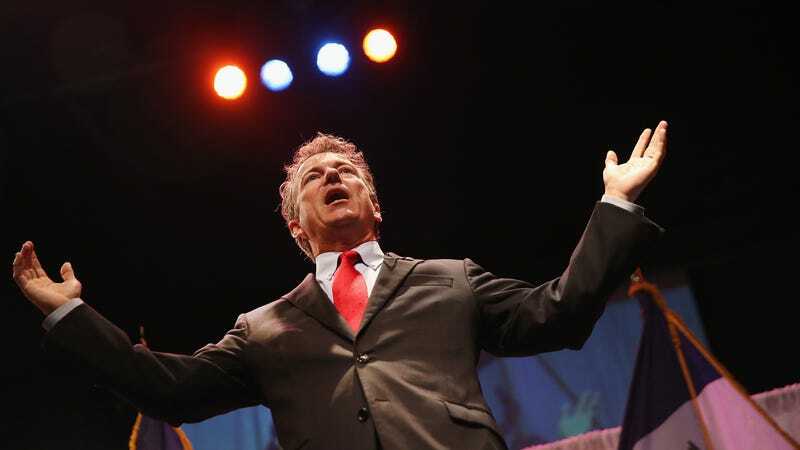 Rand Paul is obviously entitled to his own opinions—as misguided as they usually are. He should really get his facts straight before using loopholes to pushing legislation through Congress that would make the internet worse for everyone. It’s kind of like a presidential candidate saying that a $15 piece of plastic with his name on it will prevent the NSA from spying on you. Which is exactly what Rand Paul did earlier this month, by the way. This kind of misinformation isn’t just dumb, it’s dangerous.